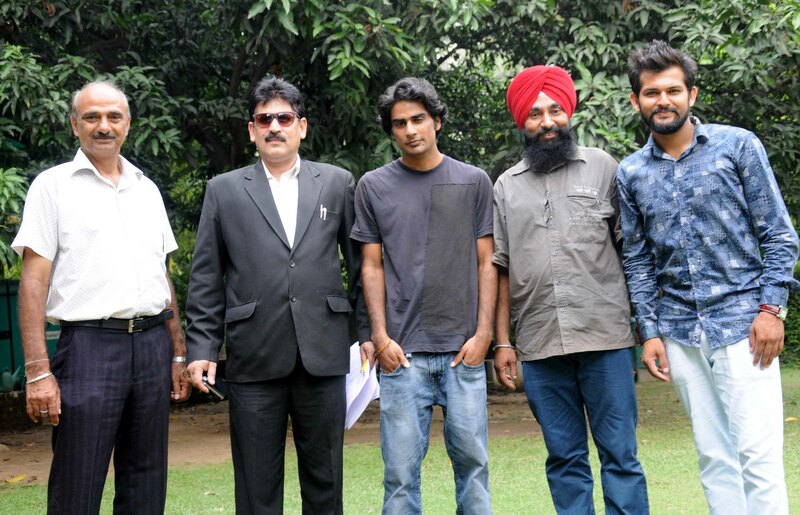 Star cast and director of Punjabi Film Bhid Ja at Press Club, Chandigarh. Chandigarh : Bhid Ja is Gautam’s first film which is written directed produced and edited by him. It is an one man crew film Punjabi film and 23% of the film is self -shot as there was no cameraman. Basic plot of film is that there are three phases in a player’s life by directors experience as a 16, 20, 24 years old boy. The star cast Amateur (Mandeep’s role played by Himanshu Sharma an ex. student of KBDAV of Chandigarh who never faced a camera before), Current (Maninder played by Michael Chang) and ex ( Siddarth role played by Gautam Narwat and according to him it’s not about winning or losing it’s all about playing. Father of Mandeep is played by a well known artist and a versatile actor of Punjabi cinema Baljinder Singh Darapuri. The movie is about Hockey which is our National game yet no goal posts equipments infrastructure is available at the grassroots level for the school going children who wanted to opt for hockey. This movie is about a young boy “Mandeep” who wanted to play hockey at the very young age and have less interest in studies and have lost his mother. His father “Balhinder Singh Darapuri” is poor hardworking man and wanted his only son to study and then help him in his business but his son is crazy and always dreaming to learn to play hockey. How Mandeep faces all the difficulties by himself without his mother’s love from home and outside and what the end bring for Mandeep is all in this movie. A leading Lawyer from Punjab and Haryana High Court Chandigarh and being a sports person himself and a national level medalist, Umpire, and ex. Rowing Coach of Chandigarh Sports department Shri Rajiv Sharma under whose coaching his team consisting of men and women brought many laurel and medals for Chandigarh till 2000 felt very proud to be associated and part of this endear and did voice over in some scenes in the movie. His son Himanshu Sharma who is playing Mandeep;s role in this movie is also a sport person and associated with rowing at Lake Club Chandigarh . Sports person can well understand the prevailing situations and difficulties a player faces in his life from beginning for better infrastructure, equipment, selection, a good diet to become a good sports man to represent at a various level. Hockey being our national game is still left behind due to less importance given on it. No makeup, vanity was used no artists charged any money shooting has been done at KUMBRA village Mohali, Doon School sector 68, Chamkaur sahib and many places in Mohali Punjab, some shots were taken at 42 Hockey stadium, NPS sector 18m Chandigarh and Army school in Panchkula. No DI or color correction has been done, no songs in the film and negligible background music. Shooting took place in mid of July 2014 and finished in mid of November editing in mid of November and in mid of January 2015 Gautem Narwat was in studio for dubbing. Shooting in a time period of six months was completed in 36 days. Censor certificate (U) from CBFC is received on 09/07/2015. Film length is one hour forty mnts that is 101 minutes. Film will release on 4th September in limited cinemas, Bhid Ja movie trailer is on You Tube.